An indoor heater is a handy thing to have, especially if you share a house with a partner, spouse, friend and having the central heating on typically ends in debate! Or, of course, if your boiler fails on you and its minus three outside. 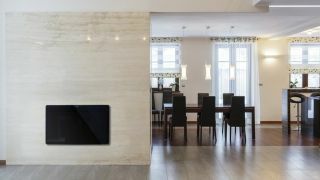 They come in all shapes and sizes, range from fan to convection and can set you back as much as £400 or as little as £20. The choice is all yours - let us guide you through our picks of the best indoor heaters out there right now. Dyson, surprisingly, head up our list of the best indoor heaters with the AM09 Hot + Cool™ Fan Heater. In addition to being ridiculously quiet (great for working environments) and powerful (quick to heat up), it turns into an air cooler for the summer months, making the £400 layout almost justifiable. If you’re looking to disperse heat equally throughout a room, a tower heater, such as the VonHaus Oscillating Tower Fan Heater, could be your best option and if you’re looking for something super-cheap to run – ie, your house has no central heating and you don’t want a scary electricity bill coming through your letterbox, an oil heater like the De'Longhi TRNS0505M Nano S Oil Filled Radiator may be just the ticket. The Dyson fan heater is as wacky looking as any of their other products (you’ve seen the hand dryers and the hair dryers) but when it comes to it, style certainly matches up to performance. Thanks to the Air Multiplier technology, the fan draws in up to 6 gallons of air per second, ensuring the room heats up quickly. Despite its output, the fan is very energy efficient, with the option to set a thermostat so the fan only turns on when the room needs heating. Heating your home with indoor heaters isn’t necessarily the most cost effective way of doing things, so if you’re looking for the best way to keep your energy bills down, an oil heater is probably the most efficient way to go. While initial power is required to heat the oil, once your required room temperature has been reached, it’ll top up the heat of the oil to ensure it remains at a constant temperature. Because it’s not a fan, this indoor heater is best for smaller rooms. With an LCD screen that you can use to regulate the temperature of the fan, this offering from Dimplex is easy to use and, as an added bonus, friendly on the pockets. You’ll either love or loathe the bright blue or red ring (the choice is yours), but with a power output of 2000W, this is up there with the Dyson. With the ability to heat up or cool down, this one is great all year rounder that is small enough to use on a tabletop. If you’re looking for a tower fan heater, this one from VonHaus is probably one of the best. There’s a range of temperature settings (you can set it on cool in the summer months) and you can put it on a timer so it’s not left on accidentally. While it’s not as attractive or as techy as the Dyson, it is cheaper and you have the option to switch up the speed settings if you need to heat up a room quickly. Reviewers also point out that its relatively quiet, which is good if you want to use it to cool you down at night in the summer months. It may not be a looker, but when it comes to heating your room quickly before bed, you’re onto a winner. We’re not saying it’s the most effective to run, either. But when it only sets you back £20, there isn’t much to complain about, especially when you’re only using it on the odd occasion. It’s very portable, thanks to the integral carry handles, and the white outer surface is easy to wipe clean.